The new year will see more alternative proteins and sweeteners, Southeast Asian flavors and 'sweet heat,' and cleaner, more natural everything. As food processors face all that 2016 will bring, some will be using new ingredients (especially sweeteners), new flavors (like seaweed and Korean spice blends) and new protein sources (plant-, algae- and possibly insect-based). Continued demand for foods and beverages that are cleaner or "natural," more nutrient-dense and "less processed" are leading food scientists to test hundreds of combinations of fruits, vegetables and spices to discover replacements for artificial ingredients. The consumer desire for such clean-label options is great, says Roger Lane, marketing manager for savory flavors at Sensient Flavors North America, Hoffman Estates, Ill. "Consumers are more connected to what they put into their bodies, so transparency throughout the entire process is key. Consumers are concerned not only with where food is being produced, but how workers who make it are being treated and what sort of impact it has on the environment." "There's tremendous activity on what constitutes natural, all natural and organic," observes Judson McLester, executive chef and ingredients sales manager at McIlhenny Co., Avery Island, La., maker of Tabasco products. He believes "the FDA will most likely adopt a tighter set of rules and more active enforcement for future [natural] product submissions." "Naturalness" has been impacting the sweetener category for a few years now. The first generation of stevia, first approved at the end of 2008, was a big step in that direction, but the initial molecule targeted in the plant was rebaudioside A. In the past year, stevia suppliers were focusing on other, harder to extract, glycosides, notably reb-M and reb-D, which are said to have less bitterness and aftertaste. Tate & Lyle's Ami Krishan, category marketing director for the company's sweeteners in Hoffman Estates, Ill., sees customers adopting a variety of low-/no-calorie sweetening ingredients in low-calorie food formulations. "Last year, stevia and monk fruit saw growth in new product launches, with stevia gaining the most momentum (103 percent increase in new launches)," he says. Tate & Lyle has been a big proponent of monk fruit, its version called Purefruit. "Sweetening combinations are also in demand. Some high-intensity sweeteners can have off-flavors when used at too high a level, so combining low levels of several different sweeteners helps achieve the right sweetness and balance." Monk fruit was Tate & Lyle's darling of 2014, but last year the company's biggest launch was Dolcia Prima, its brand of allulose. The low-calorie sugar was first identified in wheat in the 1930s. Tate & Lyle has said it's up to processors using the ingredient if they want to call it natural. Matsutani also launched an allulose sweetener last year, Astraea. Although it wasn't a switch to true "naturalness," PepsiCo last year replaced aspartame in its diet colas with a blend of sucralose and acesulfame potassium (ace-K) because of consumer concerns with the safety of aspartame. Consumer reaction to Pepsi's switch has been mixed. Meanwhile, sales of Pepsi's stevia-sweetened cola, Pepsi True, has been growing slowly; likewise for the Coca-Cola version, Coca-Cola Life. Plant-based proteins have been on the upswing, and they look to pick up steam this year. "Plant proteins are an increasingly prevalent option, since plant proteins can often be both a healthier and more sustainable option than animal protein," observes Maggie Harvey, new product development manager at Mizkan Americas. "They seem to be occurring more and more as meat substitutes and in unexpected places such as edamame spaghetti," she says. A large contributor has to do with the rise of flexitarians, or part-time vegetarians, who reduce meat consumption because of health, sustainability and animal welfare concerns. While soy has been the go-to alternative protein for years, pea protein had a breakout year in 2015. Hampton Creek, which garnered huge media attention last year, uses pea protein as the main substitute for eggs for its vegan mayonnaise, Just Mayo. Axiom Foods, Los Angeles, says pea protein can help formulators develop a clean label, contribute to water conservation and satisfy the need for a neutral ingredient for flavor-forward food formulations. Not only are peas 100 percent vegan and rich in iron, they're hypoallergenic, easily digestible and take less water to grow than to raise a cow, says Axiom's CEO David Janow. Pea protein is viscous enough to be used in desserts, baked goods, granola bars, pasta, mayonnaise and even processed fish, meat, meat-substitute and egg products. One novel source of plant protein is algae. Solazyme Inc., South San Francisco, Calif., has been a pioneer in algae-based ingredients, starting with its AlgaVia Whole Algae Flour, which delivers protein along with fiber, healthy lipids and micronutrients. Whole algal flour and algal protein are the main ingredients in the VeganEgg, a 100 percent plant-based whole egg replacer. It replicates the flavor, texture and functional properties of eggs, and can be scrambled, used in omelets, baking and cooking. 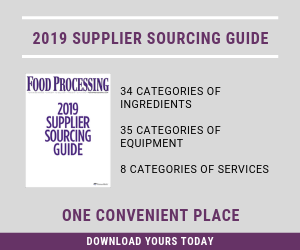 It's selling like crazy on Amazon and select independent food retailers, reports brand owner Follow Your Heart, Canoga Park, Calif.
Perhaps plant proteins can be paired with dairy proteins, suggests Jean Heggie, strategic marketing lead at DuPont Nutrition & Health, St. Louis. "Evidence is supporting the sensory and economic benefits of dairy and soy protein blends across a variety of applications, while nutrition research is demonstrating the benefits of soy and dairy blends in maximizing muscle gains." Oats continue their solid run. In 2014, bakery products formulated with oat beta glucan in North America increased 64 percent, noted Nancy Gaul, senior health and wellness category manager-global marketing at Tate & Lyle. Grainful, Ithaca, N.Y., is pushing oats back to mealtime with two product lines, Steel-Cut Meals (including cheddar-broccoli) and Steel-Cut Sides (e.g., jambalaya). "We're taking oats beyond breakfast and moving them into dinner," says Jeannine Sacco, chief recipe developer and cofounder. "They're full of fiber, complete proteins and full of other nutrients in one gluten-free, heart-healthy package." With their chewy, grainy, slightly nutty flavor, they taste nothing like the rolled oats in instant hot cereal, but more like risotto. Also looking to make a mark in 2016 is seaweed, thanks to its sustainability and umami appeal. "Seaweed and spirulina have been popping up more frequently," says Jean Shieh, marketing manager of natural ingredients at Sensient Natural Ingredients, Turlock, Calif. Product innovations with familiar ingredients, such as nuts and tofu, will help widen the consumer base. The U.S. market for organic foods and beverages is performing at a lively pace, and will continue to do so for at least three more years because of the healthy, clean and better-for-you movements. But how does that translate for food manufacturers? We've compiled several articles and white papers to illustrate how natural and organic ingredients are being used to sell more food and beverage products. After a rough six months due to last spring’s avian influenza outbreak, the egg market has a positive outlook. John Howeth, executive vice president of the American Egg Board, Park Ridge, Ill., affirms egg supplies are recovering well. The rebound is due to farm repopulation, more egg imports, fewer exports and unaffected farms increasing production. "Egg product inventory is down only 2.5 percent versus a year ago," he says. "With supply coming back, prices should drop in the first quarter, and by mid-year we should be at near 100 percent, barring any further outbreaks." The persistent push for regional, authentic flavors may be driven by millennials. "It’s not sufficient to simply call out Asian flavors; consumers want more provenance," says Sensient's Lane. "Trends are moving into specific regions of Asia, and there's going to be a renewed focus on Korea in the coming year." Gochujang, a savory, spicy and pungent fermented Korean condiment made from red chili, glutinous rice, fermented soybeans and salt, is rocketing to the front of the pack, Lane adds, "so it only seems natural that other flavors from that region will be trending." Garth Vdoviak, product development manager at Mizkan Americas, Mt. Prospect, Ill., sees a correlation with the growing Asian and Hispanic populations and popularity of the company's Border Foods Red Jalapeno Puree. "Red Jalapeno Puree works well as a base and in variations of Harissa sauce and curry ketchup, and in a supporting role for Gochujang and aleppo pepper sauces," he says. "It helps build the body of a sauce while supplying heat and exceptional flavor and has become a go-to ingredient in many of our formulations." McLester says McIlhenny looks for the next adaptation of sweet heat. "The pairing of complex, fruit-derived flavors with three-dimensional heat will be the next big trend," he says. "Blackberry, raspberry and passion fruit are merging with jalapeno, chipotle and habanero. There will be more heat, but gone is the need for the hottest item from which consumers can barely take a bite. Now, it's ethnic variations of heat with sweetness, acidity and different types of heat." McCormick & Co., Hunt Valley, Md., in its annual Flavor Forecast, "tracks the growing interest in heat and identifying upcoming spicy flavors including chipotle, peri-peri and harissa," explains McCormick executive chef Kevan Vetter. "The next wave of this is complemented by tang. Look for Southeast Asian sambal sauce [which is] powered by chilies, rice vinegar and garlic to take kitchens by storm." The Flavor Forecast also notes under-explored tropical Southeast Asian fare – Malaysian and Filipino – as vibrant, adventurous and bold. The flavors mesh well with the continued evolution of consumers' insatiable appetite for spicy. Also, Peruvian chilies like rocoto, aji amarillo and aji panca are being married with lime. Sensient Flavor's Alan Owen, director of marketing for sweet flavors, says heat will be more than just a burning sensation. "Millennials and Generation Z both love heat, but it will be more an overall flavor profile." Vdoviak agrees, saying, "There will be more use of peppers with less overpowering heat and more emphasis on Peruvian Aji Amarillo, Moroccan Harissa, Syrian aleppo pepper and Korean Gochujang." Vetter adds that multicultural and tropical Asian flavors from Malaysia and the Philippines will draw attention from those seeking bold new tastes. Pinoy barbeque, a popular Filipino street food, will be an upcoming treat as will rendang curry, a Malaysian spice paste. Smoky, ancestral flavors such as Mezcal, a Mexican liquor made from the agave plant, will be increasingly popular, McCormick continues. Lane agrees that smoke will be hot. Newly created smoke flavors are popping up in ganaches, pastrami and cocktails, infusing flavors from teas and spices right into the dish. "There are indeed more flavors in the smoked/burnt category," Lane affirms. "The artisan and handcrafted trend is driving these flavors to the forefront. This could cover anything from a grilled to a caramelized flavor. It’s really about how close to the flame the consumer is looking to get." Will Spicy Dairy Foods Catch Fire?